Let's take a look at the Antarctic krill. They are 6 centimetres long and unlike any other animal of this size, they are capable of filtering out diatoms, single cell algae, from the water. It is the algae that makes use of the energy from the sun, and Antarctic krill are the only really small (rather than really tiny) creature that can make use of them. They can get a bunch of their legs together to form a 'feeding basket' where plankton is collected. Gaps in the wall of this basket can be as small as 1 micrometre. There are 1,000 micrometres in a millimetre. They also eat algae from the underside of floating ice. In fact one individual can eat a square foot of this algae in ten minutes! 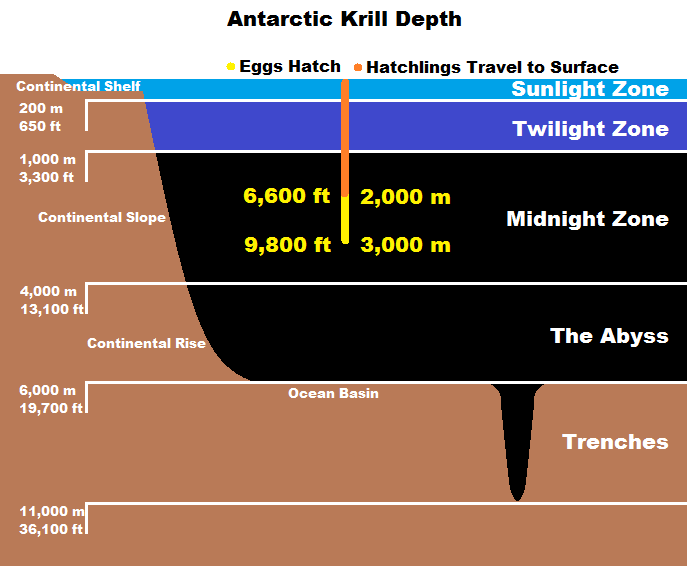 But you don't get '1 Antarctic krill'. These guys swarm into densities of up to 30,000 individuals per cubic metre, other species of krill can double this. Of course, one main reason it would get quite this dense is because that cubic metre is surrounded by yet more cubic metres of dense krill, so we are talking about gigantic numbers of krill. If you put them all on a humongous weighing scale you would get their biomass. 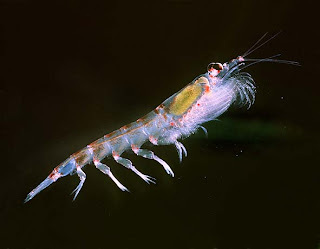 It is reckoned that the Antarctic krill has a biomass of 500 million tonnes, twice that of all humanity and probably more than any other living thing on Earth. They also go through a vertical migration several times a day. It seems they go to the surface to eat and hilariously, once they're full they just don't move so much anymore and end up sinking. Once they're hungry again they start moving to the surface again until they're full again. I have that kind of relationship with things like beds and couches and we all know we should never go swimming on a full stomach. What about the next generation? Female Antarctic krill can lay up to 10,000 eggs each. That adds up to a number of eggs best represented by "lots x 10^lots". 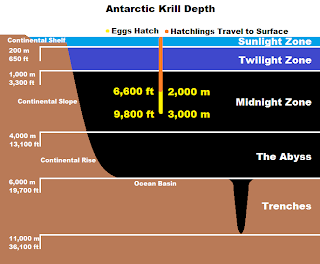 They sink to the bottom of the sea, depths of 2,000–3,000 metres (6,600–9,800 ft) before hatching. Then, the tiny babies emerge and immediately begin the daunting task of migrating back to the surface, a journey that can take 3 weeks to complete. That's just... I can't even... I just can't. And what eats krill? Fish, squid, birds like penguins, albatross and others, all sorts of seals, whales and people. It's reckoned that about half of all Antarctic krill are eaten up each year but these numbers are replaced with the bewildering number of eggs they lay. A creature that can fit in the palm of your hand supporting the biggest animals in the world. Amazing. Video taken from The Blue Planet. Fascinating! The story of life on this earth never ceases to amaze me.